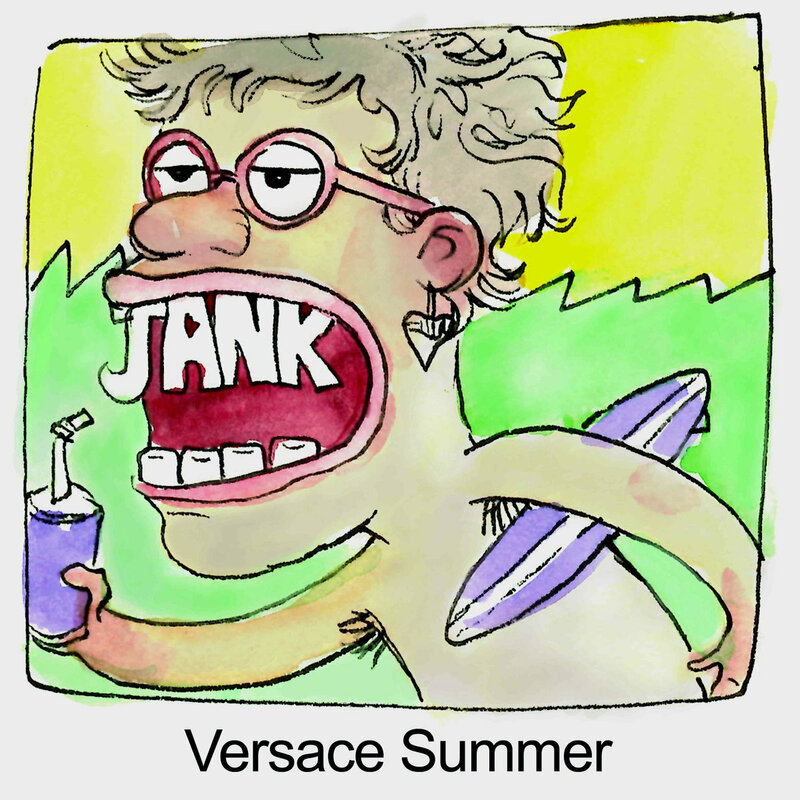 The Philadelphia based three piece Jank have put out their third release, an EP titled Versace Summer and for a band that describes their sound as Weed Pop their sound is dynamic and has broad appeal. The EP works in the worlds of pop, surf, lofi, punk and noise rock combining all (sometimes at once) for a pleasurable breezy run through from a clearly talented band. Things start a bit grimy on "Grim Reefer" as the band uses feedback and a touch of angst to play with sonic dynamics over shouting lyrics but things get clean fairly quick as some dexterous guitar work brightens up "Chunks (cool enuff)" that while lyrically is questioning relationships, musically it is confident and soaring. That clean bright sound sticks around for most of "General Tso What?" with fluid lines before crashing into an unfiltered end blast. This back and fourth between pretty and ugly is at the root of Versace Summer moving from a love song about a bike ("This is a song about my bike "Ralph" and it's called "Ralph") to the more raw ("Alligator") but it is when the styles mix in the same track the best results are found. "#freesam" lets the drummer get after it gloriously pushing the action on the other hand the experimental "Gucci Spring" is just an odd filler (strange for an EP) before the deft playing of closer and title track which stops and starts on a dime. The trio (Matt Diamond - Guitar/Vocals , Ruben Polo - Bass/Vocals Sam Becht - Drums) are incredibly talent which raises this over other offerings that mix genres like this. They have crafted catchy numbers blending the breezy beach surf pop with gritty city power for Versace Summer.